Many years ago, when I was writing my dissertation and struggling with the section I was working on, a friend reminded me that Thomas Mann once said, a writer is someone for whom writing is more difficult than for other people. When we’re having a hard time, it’s helpful to know that we’re not alone. But over the years, I’ve come to think that Mann’s quote is misguided and misleading. Because writing doesn’t have to be hard, and if it is hard for us, we don’t need to over-emphasize the difficulty, but instead can accept the challenge for moment and be open to noticing shifts. In my many years in academia and as part of the “professional” writing world of creative writers, I heard over and over again how “hard” writing was. The idea was that real writers suffered. But rarely did I see suggestions or guidance to help understand what was making it so hard or guidance to help writers come into more ease while still caring about the craft and outcome of what they produced. There seemed to be a strange double bind: it can’t be good without being difficult. I have come to believe that it is possible to find both ease and power in our writing. I’ve been teaching writing for more than 15 years, and I see many of the same misperceptions come up again and again for my students. I have also seen students struggle with the same issues and ask the same questions. So I decided to write a book just for the members of my community that lays out the seven essential steps to finding your authentic voice, embracing your story and writing with more ease and power. I spent a long time working on this book and designed it so it’s a really beautiful book, something that you can come back to again and again. If you haven’t seen it yet, or even if you have, I hope you’ll explore this downloadable ebook as a resource that you can use for the long term. 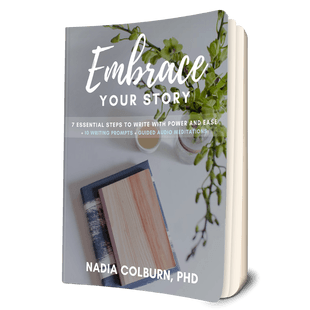 The book, Embrace Your Story, addresses many of the misperceptions, fears, questions, and challenges that I have seen come up again and again for my students. And it also lays out a path to writing in deeply rewarding and fulfilling ways so that you feel you can write whatever it is you want to write and enjoy the process. It’s full of information and tips about how to establish a successful and fulfilling writing process and life. And it also has writing prompts throughout and an additional ten writing prompts at the back of the book. In addition, the book comes with two 15 minute audio meditations to help you with your writing. They each start with a five minute meditation and then give you ten minutes to write. You don’t need a lot of time to get powerful writing done, especially if you start with a meditation that primes you for this kind of work. In just ten minutes, you can do powerful writing. Whether you’re seeing this ebook for the first time or not, give it a try! And let me know what you think! I always love to hear from you. And if you like it, please share with friends.